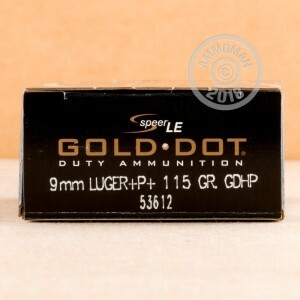 This 9mm Luger ammunition from Speer's Gold Dot Law Enforcement line uses a +P+ loading that is suitable only for the most sturdy firearms. It fires an 115 grain Gold Dot bonded core Jacketed Hollow Point projectile at 1,220 feet per second, delivering excellent terminal performance with a very stout recoil. The Gold Dot is a real-world proven design that uses a molecularly bonded jacket and core to provide reliable penetration and expansion. This particular version of the Gold Dot uses bullets optimized for the extra high velocity of the +P+ round. These cartridges are loaded in Lewiston, Idaho using nickel-plated brass cases and primers from Speer's sister company, CCI. They come in convenient 50 round boxes. 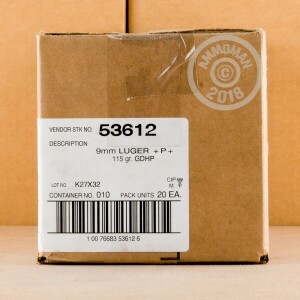 This case of 9mm JHP Gold Dot LE ammo ships free from AmmoMan.com. 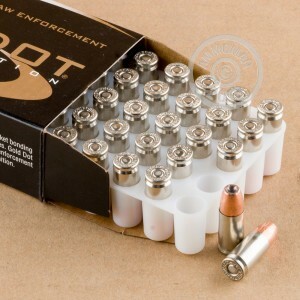 High-quality self-defense ammunition at awesome prices.